Sunday Mass at St. Mary parish in Manhattans Lower East Side could remind an observer of the childrens visual riddle: Which one of these things is not like the others? Among the sea of Latinos, who make up roughly 75 percent of the parishs population, stands Father Neil Connolly, 100 percent Irish-American and silver-haired at age 73, celebrating Mass in crisp Spanisha language he has mastered after working nearly 50 years as a priest in New York City. After Mass, Father Connolly glides through a crowd of more than 250 participants, mingling easily with children and adolescents, active adults and senior citizens. He moves from one to another as seamlessly as he moves from Spanish to English, from youth group to social action committees, from Eucharistic minister recruiter to sound system technician. Whether Father Connolly has a word of sympathy for someone in sorrow or extends his hearty handshake to an enthusiastic parishioner, he is at ease and at home wearing the many hats required of a pastor. 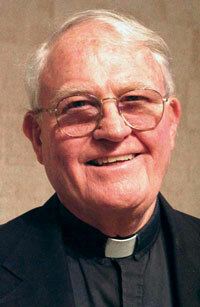 Despite the obvious physical, ethnic and linguistic disparities between pastor and parishioners, Father Connollys chameleonlike ability to connect with his different parishioners is not a surprising oddity; the fundamental ground of his long priestly ministry has been a commitment to know his parishioners and understand how best to deliver the message of Jesus to them. Throughout his life as a priest, Connolly has worked with and for his parishioners as a teacher and advocate of lay leaders in the church. While giving thousands of lessons to parishioners over the years, he is also a student of the laity, learning by working with the people of God how a community can grow closer in faith. Roughly half a century ago, immediately after his ordination at age 24, Neil Connolly, a son of Irish immigrants, traveled to Ponce, P.R. to take part in a pioneering New York Archdiocesan language-immersion program in Spanish. I was there to lose myself in the culture and get into what I was doing by giving as much of myself as I could, says Father Connolly of those eight weeks. That is such an important factor when you go somewhere else. You have to realize you are in a different place and try to observe. Neil Connolly did not realize how different his new environment really was until he ventured out on weekend assignments down dusty roads to remote towns to celebrate Mass in the campo (the countryside) under a large tree or near a tin-roofed chapel erected by the local community. It was within these small communities that he first encountered a congregations commitment to establish a parish without clerical leadership. These campos had no clergy to run their churches, Father Connolly recalls. So it was an absolute necessity that the people themselves assumed the responsibility to keep the churches running. It was the people who implemented the changes in the church from within. Those days in Ponce were also occupied by less pious endeavorsplaying basketball and attending such community events as dances and parties. Looking back, Connolly says that those casual exchanges with his parishioners allowed him to gain a better understanding of those with whom he worked. It is important to hear the sighs of the people, and you cant do that if you are not touched by them, he says. I want to be colored by what happens and by where I live. In the hills of Puerto Rico, Father Connolly experienced the benefit that an empowered laity brought to a struggling congregation. Years later, he would draw wisdom from those lessons in a place that bore little resemblance to rural Ponce. After his post-seminary weeks in Puerto Rico, Connolly returned to one of the most densely populated areas of the United States, New York Citys South Bronx. At St. Athanasius, a parish with a high percentage of Spanish-speaking congregants, he immediately drew on his language skills and ability to adapt to and learn from different people. Convinced that the fundamental strength of the church was to be found in its parishes, Connolly soon established himself as an educational leader who encouraged his parishioners to learn from one another and work for change within their own community. He was a teacher who thought people should live and learn their faith together, says the Rev. Louis Gigante, who worked with Father Connolly at St. Athanasius for nearly 20 years. Neil taught laypeople how to teach each other. In Father Connollys third year at St. Athanasius, the parish began a summer program that brought multicultural events to parks in the South Bronx as a response to the drug activity and violence that had dominated many neighborhood public spaces. The success of that initial program led to a more ambitious effort in the borough: Neil Connolly was assigned to oversee a satellite parish at Spofford Ave. in Hunts Point. The efforts of just over 100 committed churchgoers established a new storefront chapel next to a luncheonette. The people knew they were a little group and had to take responsibility for their parish, says Father Connolly, who often quieted his own voice in order that others might lead. We had to decide things as a community. I wanted to be there as a facilitator and offer support but allow the laity to take ownership of what goes on. During one of the storefront chapels early days, an elderly lady complained to Father Connolly about the number of working light bulbs in the chapela grand total of oneand asked him to do something. Rather than fix the problem, admittedly his first instinct, he instead suggested, Say something yourself. She addressed the congregation at Mass, and as a result electricians volunteered to rewire their homemade place of worship. In a small but critical way, Connolly said, this elderly woman had emerged as a community leader. Father Connolly and his fellow priests at St. Athanasius also reached out beyond their single parish to address challenges that arose from the hotbed of racial and socioeconomic tension that was the South Bronx. We realized that the clergy could be used as an instrument of change, he says. The thought was, We gotta use collar power to confront local authorities about miserable conditions in our neighborhoods. Neil Connolly and other members of the South Bronx community took action. They brought complaints to officials regarding heating problems in government housing. When they were ignored, they organized demonstrations, going so far as to disrupt a New York City Council meeting. The organizing efforts by the priests and the active involvement of the laity led to changes that had a direct impact on the lives of all members of the community. Today, Father Connolly notes, the laity is notably absent from the hierarchical leadership of the church, leaving a resource untapped and most members of the church without a voice. Parish life is where the heart of the church is, he says. But leadership is not always selected from this group. Instead, academic and theological scholars are chosen as religious leadersindividuals Connolly finds to be intelligent and thoughtful, but not representative of most parishioners. The limited ability of community members to graduate from positions of informal leadership to more official and influential positions within the church hierarchy is not the only obstacle to community empowerment and spiritual fulfillment that the church faces, says Father Connolly. Denying the laity access to formal leadership positions within the church threatens the churchs ability to meet the needs of all Christians who seek a religious connection. Indeed, because of diminishing numbers of the clergy, there are fewer priests available to share the sacraments within the church. Everywhere the faithful are being deprived of the Eucharist, Father Connolly points out. If the church were to allow women and married men to be ordained, Mass could be more widely offered, and this would be good for the life of the church community. The only way to reverse the current trends, Father Connolly insists, is through a commitment by the church hierarchy working with parish communities to spread the message of Jesus together: The church is always a community in search of the good news of salvation. But the church thrives when there is a healthy and honest struggle to look for real solutions to real problems, not when it is content, comfortable and triumphal. That is not what Jesus intended. When Neil Connolly envisions such solutions, they recall the efforts of the communities in Ponce and the South Bronx that, in establishing their own parishes, cultivated their own relationship with God. The solutions they found for particular challenges are stories of people finding their way to God, with the guidance of clergy, but more importantly, through their own devotion to Jesus. Our relationship with God is the most important thing. It feeds us and gives us insight, Father Connolly says. If we as Catholics believe this, we can sustain ourselves through trials and tribulations and grow into our full promise as a church. Whenever the ordination of women is brought up I've begun to wonder if the fact that we are trying to reunite with the Orthodox church is ever considered. If the Roman Catholic church began to ordain women all efforts at reunion would stop. If you don't believe me go ask an Orthodox priest or Bishop. This article also appeared in print, under the headline "Student of the Laity," in the February 4, 2008 issue. Matthew P. Moll Matthew P. Moll, a 2003 graduate of Marquette University, moved to Brooklyn as a member of the Jesuit Volunteer Corps and is currently studying New Media at the Columbia University Graduate School of Journalism.